Versace and Giorgio Armani are both famous names in the market. Both companies produce fashion and luxury stuff, ranging from ready-to-wear products to fragrances. In this article, we are going to discuss about two men’s fragrances from these two companies that often make people torn apart: Versace Eros and Acqua Di Gio. Both are fresh aromatic scents suitable for young men. So, Versace Eros vs Acqua Di Gio, which one is better? 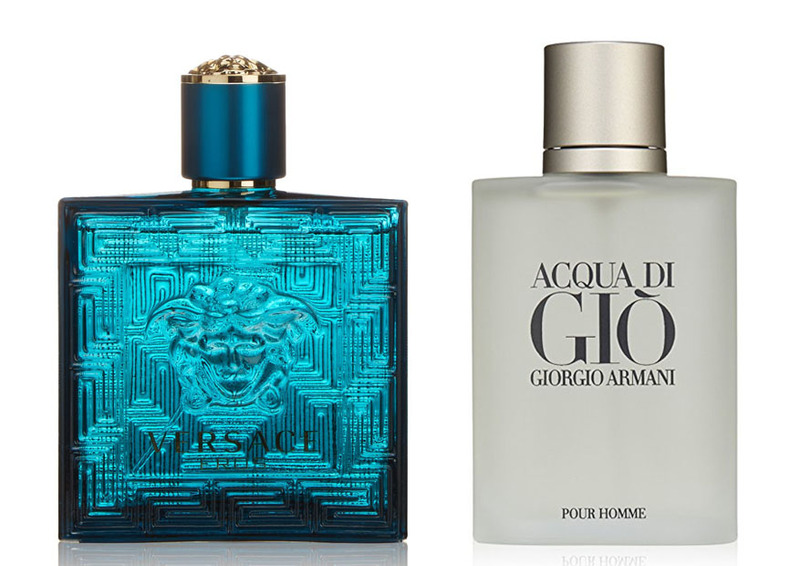 Although Versace Eros and Acqua Di Gio are both fresh aromatic fragrances, they have quite different characteristics. Let’s start with Versace Eros. The opening notes consist of mint, green apple, and lemon. The combination feels very pleasant and refreshing. It then transforms into the sweet and warm heart notes of tonka bean, ambroxan, and geranium. Finally, the base notes are vanilla, cedar, vetiver, and oakmoss. The scent is loved very much by many people. The captivating scent is quite versatile in a sense that it is suitable for all seasons, but it is more suitable as a night wear. It is not exactly good for day wear. On the other hand, Acqua Di Gio’s opening is much more fruity and citrusy, featuring lime, lemon, orange, and bergamot notes that are further supported by jasmine and neroli. The aquatic heart notes are also sweet and floral, with a complex blend of cyclamen, peach, freesia, calone, hyacinth, violet, rose, mignonette, and rosemary. There are also some sharp notes from the spices, coriander and nutmeg, which are softened by the woody base which consists of cedar, white musk, oakmoss, patchouli, and amber. Acqua Di Gio is especially great for the warmer months of the year. Unlike Versace Eros vs 1 Million that we previously discussed, Acqua Di Gio is more suitable as day wear rather than night wear. It is also more suitable for work than Versace Eros. If strong projection and long-lasting longevity are your priorities in choosing between Versace Eros vs Acqua Di Gio, don’t doubt any longer – get a flacon of Versace Eros right away. The fragrance is not only famous for the cool, fresh scent, but also because of the excellent projection and longevity. It has a strong sillage that can cut through the room, making people notice about your presence. It is also quite long-lasting, able to last for more than five hours. On the other hand, the projection and longevity of Acqua Di Gio are rather moderate. It only radiates within an arm’s reach. So, it is great if you don’t want to get too much attention and just want to smell nice to the people nearby. Nevertheless, it has pretty good longevity. It can last for at least two hours and up to three or four hours. - Packaging for this product may vary from that shown in the image above. - We offer many great sales and discounts making this fragrance cheaper than at department stores. If you are looking for a casual fragrance for going out, Versace Eros is definitely the best choice that you can make. It smells fresh and captivating, and it has great projection and longevity. However, if you prefer a more moderate sillage, you can choose Acqua Di Gio instead.